Doris, who spent most of her life in the nation’s work force and is the mother of middle-aged children struggling to eke a living wage and sometimes having to join the crowd of folks jumping through the hoops for unemployment insurance benefits that fail to meet the cost of staying alive, clearly understood the plight of the American worker today. Indeed, before we retired, Doris and I both experienced the degeneration of working conditions on the job market. We grew up in the 1950s and 60s and experienced the nation’s brief era of prosperity, when jobs were so plentiful if we didn’t like the one we had, there was another one waiting for us just down the street. Employers offered health and life insurance benefits and paid vacation time just to entice good workers to remain on the job. Those were the days when labor unions ruled the roost in many shops. That was a grand period when a college degree or job training was something just about anybody could afford. I could usually earn enough on a summer job to pay the cost of books and tuition for the fall and spring terms. I covered the cost of my room and board with the money I made working in the university food commons. It seemed as if the assassination of President John F. Kennedy in 1963 marked the beginning of America’s downhill slide. Vice-President Lyndon Johnson took the reins of the nation and drove us into an escalated horrific war in Vietnam that served to build the U.S. military industrial complex into the power force it is today. Big corporations saw huge profits serving that complex and that war, at the cost of 58,148 lives of American soldiers. The war had no other purpose than to feed the corporate money machine. It had nothing to do with defending the nation. It ended in a draw. The winners were the fat corporate executives who got very wealthy feeding on the profits of that violent jungle war. Since then, America seems to have been constantly involved in some kind of scaled-down warfare, we have experienced runaway inflation with prices rising faster than our paychecks, and we have seen an all-out assault on organized labor. 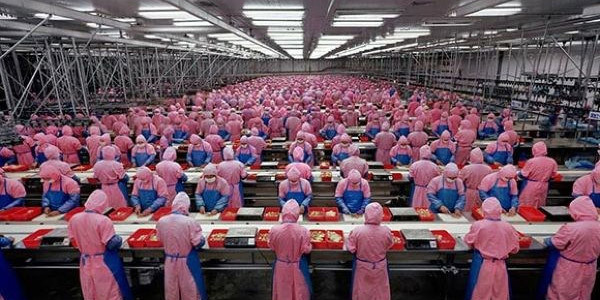 Trade agreements with the world markets have allowed American corporations to move factories and jobs overseas to utilize cheap labor, and jobs at home have been drying up. The effect on American workers has been dramatic. No longer protected by union contracts, workers have been subjected to pay cuts, loss of benefits and job security. Many states have adopted “right to work” laws, a label the belies the fact that the laws rip the guts out of union contracts and give employers the freedom to hire and fire workers at will and without cause. It should not be surprising then that a survey by Workplace Democracy Association found that one of every four American workers compared their workplace as a dictatorship. The story noted that job morale was low and we can expect that under the circumstances, the concept of pride in workmanship has all but disappeared. With ultra-conservative Republicans now rushing to overthrow the Obama Administration and grab power in Washington, the prospects for any kind of return to a time when the wealth was more evenly distributed, and anybody that wanted a good job could find one appear grim. It is no secret. The corporate bosses clearly look down from their ivory towers and perceive the common workers as if they are, indeed, slaves to the system. The plan is to force as much labor as possible out of them until they drop, then leave them by the side of the road as the parade moves by. In the quest for wealth and power, compassion for mankind appears to have been lost. But as my wife reminded us all every time she posted on Facebook . . . “We Are Not Slaves.” There is something noble in each of us. We must all remember that and join the quiet revolution occurring all over the nation to take back our personal sovereignty. Failure to do so may push us back into a twisted version of the dark ages.